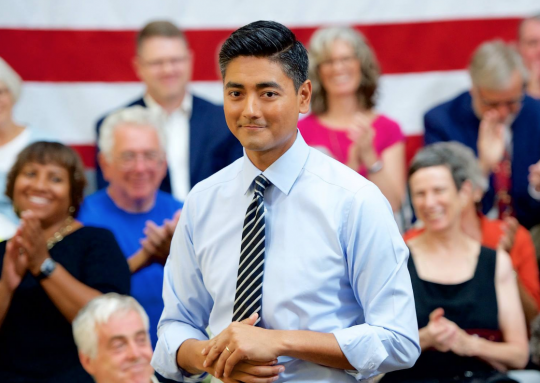 Ohio Democratic congressional candidate and Hamilton County Clerk of Courts Aftab Pureval is being sued by one of his former employees. Brittney Heitman, who worked in the Clerk of Courts office, is suing Pureval for breach of contract and financial loss, Fox 19 reports. In her lawsuit, Heitman accuses Pureval of violating an agreement he made by saying in interviews he was ridding the office of political patronage and "make work" jobs. Heitman worked in the Clerk of Courts office from June 2012 until her firing on Feb. 17, 2017. She had received positive performance reviews and was credited with creating a new program which has helped the office with collections. After her termination, which occured when Pureval took office, Heitman signed a non-disclosure agreement and received $4,808.26. Several other employees were fired under similar circumstances at a cost of over $116,000 to the county government. The agreement also included a non-disparagement clause, which dictated neither side could say anything negative about the other. According to the suit, the clerk of courts and/or Pureval have violated the terms of the agreement. Pureval described the firings as ridding the office of political hires, and nepotism hires, "thereby calling into question Heitman’s qualifications for her prior employment and generally casting a shadow over her personally and professionally," her suit states. The day after she was fired, Pureval was quoted as saying referring to the firing of Heitman and others: "We are not going to tolerate partisanship, nepotism, or make-work jobs at the courthouse." Chris Finney, a lawyer for Heitman, accused Pureval of improperly using his current office as a weapon against his critics. "He used the tax dollars to silence his critics. And then he also promised not to disparage them, but then he did. He accused them of nepotism and patronage and our particular client was neither of those," Finney said. "She was just a career employee that had worked in the clerk of courts operation and then prior to that at an auto license bureau and so he disparaged her. And so she'd like to be free from the agreement and comment honestly about her impressions of his performance while in office." Pureval’s campaign manager, Sarah Topy, blamed the lawsuit on Rep. Steve Chabot (R.), who Pureval is challenging in November. This entry was posted in Politics and tagged Congress, House of Representatives, Lawsuit, Ohio. Bookmark the permalink.